One of the last of the old school meat and 3’s in Austin. Established way back in 1948 when Austin was a very,very different place indeed. The old warehouse district of Austin’s East Side would’ve been a prime place for me to time travel to as I expect it hosted numerous little cafes and barbecue joints back then. 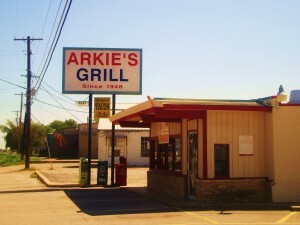 Arkie’s is the only extant one. I go here for a Southern breakfast that could beat the band. Housemade sausage, fried eggs, biscuits and gravy, grits-the list goes on forever. The waitress makes sure your coffee never dips below half full and you will be honey babied right til you walk out the door. This is a byob establishment however. As in, bring your own butter as they offer that weird yellow salve that has never come anywhere near a milk cow. No matter, I still love Arkie’s Grill. This entry was posted in Texas Daily Photo. Bookmark the permalink.